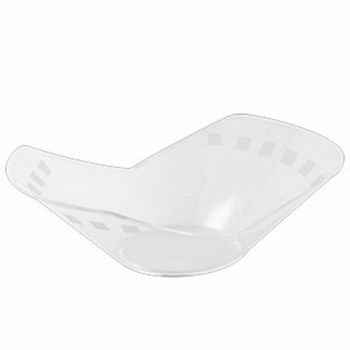 Product: Mashers Domino Mini Disposable Clear Plastic Dessert Bowls – Packs of 50 was added to cart. Masher’s Domino Mini Disposable Plastic Serving Bowls will make a stylish addition to any wedding reception, cocktail function, banquet or birthday party. Made from durable plastic and finished with a geometric domino inspired design, they are perfect for serving mini desserts, canapes, dipping sauces, and tapas. Supplied in packs of 50 or wholesale packs of 1000, these versatile disposable plastic dessert containers are stackable, washable, reusable, and suitable for serving both warm and chilled foods at parties and events.